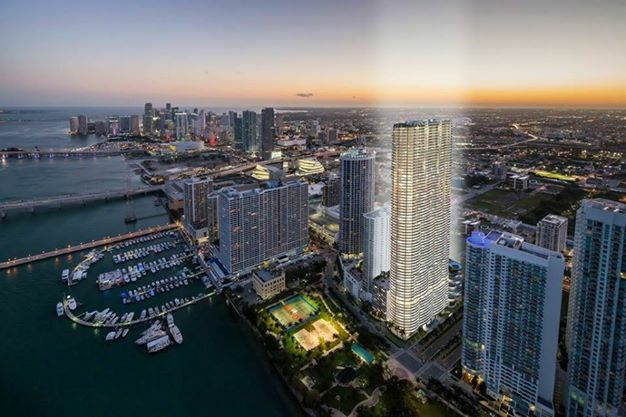 Melo Group is preparing to begin converting reservations at Aria On The Bay into contracts this week, ahead of construction. Condo documents were filed last week, and the developer recently obtained approval to connect the building to local utility service. As of last week, 42% of the 647 units in the Arquitectonica-designed project were reserved, according to broker Michael Light. Units are priced at an average of $536 per square foot, although that is scheduled to increase soon. A party to celebrate a new sales office will be held on February 12. Completion of Aria is planned for late 2017. I don’t care what some people say, I’m glad Melo is in Miami. Nice addition for the neighborhood. Looks like Melo actually hired an architect for a change. The silence speaks volumes. Any Melo headline used to attract hordes of naysayers. Ironically, though most of them migrated to Related/Arquitectonica headlines, even Arquitectonica’s not catching flack on this one. Still plenty of those. They just switched to bashing Paramount at WorldCenter. That building had become a new lightning rod for panicking Miami Beach posters (they fear that revitalized downtown will reduce tourist flow to their little overhyped island). Sadly, you’re right XVS, too many small minded and selfish nitwits in the county who ponder nothing but doom and gloom about anything positive that’s annonced practically anywhere in Miami. Pity they don’t understand the more Miami is developed and improved, the more tourist will be drawn which will benefit Miami Beach too.